Corpus Christi, Texas has a litter problem. While the litter is varied, plastic bags are a main component and the City spends about $190,000 annually cleaning up disposable plastic shopping bags lifted by gusts of wind from the city landfill. Not only is the litter an eyesore, but the cleanup is expensive and the litter does not do any favors for the tourism industry, which is a vibrant part of the local economy given the City’s prime location on the beautiful Corpus Christi Bay. The city knew they had a problem on their hands and to help wrap their minds around the issue they posted an online survey in April to try to get to the bottom of how residents use plastic bags. This simple research was a great way for the city to access the root causes of the problem and plan their course of action. There was a fair amount of participation with a total of 689 people filling out the survey. About 47 percent of those survived stated they always use plastic bags when they shop with a majority confirming they do in fact own reusable shopping bags. The numbers were pretty evenly split regarding how often those who own reusable grocery bags actually use them. About 59 percent of those surveyed did not back the notion of a law or ordinance to ban plastic bags. This response is typical – people do not like being told what to do; however, sometimes a simple law helps bridge the gap from people sometimes using their reusable bags to always bringing their reusable bags when they shop. Another valuable piece of data gleaned from the survey is that most people did not know where to drop off their plastic bags for recycling. This information will help direct any campaigns the City or local retailers undertake to help educate the public. 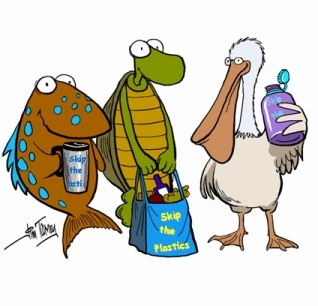 To combat the plastic bag litter problem Joe Adame, the mayor of Corpus Christi, recently proposed that the city step up enforcement of anti-litter laws and local retailers pay for an outreach program that will encourage residents to bring reusable bags when they shop. Community groups are encouraging the City to charge a 5- to 10-cent fee per each plastic bag handed out at the checkout lane. The idea is that the money raised by this fee could then be used to help educate the public on the environmental dangers and financial pitfalls of disposable plastic bags while encouraging the use of reusable grocery bags. The community has also suggested a $1 per plastic shopping bag fee similar to the fee in place in nearby Brownsville. The capital produced by this fee could be used to finance cleanup endeavors throughout the City. The City Council agrees that litter is an issue plaguing their beautiful city that needs to be addressed, but at this time they are not on board with a fee. After reviewing the results from the survey, as well as the findings from litter cleanup efforts the City has decided to put the idea of a plastic shopping bag fee on hold for the next year and focus their efforts on a media campaign to encourage residents to clean up the litter problem and some stepped up ordinances to handle people who litter. The local anti-plastic bag supporters are disappointed in this turn of events because other cities have tried voluntary efforts to curb plastic bag use and litter problems and no one has yet to be successful. Ideally the City of Corpus Christi’s plan would work out and be a great solution. Putting the responsibility and power to fix the problem in the hands of the people who call the City their home should in theory work. While this is a great idea in concept, it is very likely this will not translate to a remarkable success in practice. The City is simply asking people to fix the problem – the residents are free to ignore the litter reducing suggestions passed on via the media campaign and continue using plastic bags and abusing the planet. There will certainly be some people whose eyes will be opened by the media campaign and will in turn increase their environmentally-friendly reusable shopping bag use, but these residents will probably be few and far between. People have to make a conscious decision on their own. Ordinances to thwart litter are an excellent measure, but some of the plastic bags that wind up as litter were not supposed to end up that way. When plastic bags are tossed in the trash and dumped in the landfill they can at that point become caught in the wind and deposited on streets and in trees. Anti-litter ordinances can do nothing to stop unintentional litter that rides the wind. Ordinances are only effective if the intentional litterbug is caught in the act. Unfortunately, the City of Corpus Christi may need to take a more serious stance and back up their encouragement with some hard cold anti plastic bag laws. The fee structure has been proven to reduce plastic bag consumption. No one likes paying the fee, sometimes referred to as a tax (which makes it even more loathed), so people come around to the idea of at least giving reusable bags a try. After a test drive most people find reusable bags are not that bad and they are actually quite convenient. The fee forces people to change their habits and get out of the plastic bag rut they were stuck in. Banning plastic bags is equally controversial since it forces people to quit using plastic bags altogether. Again, this method is proven effective. Implementing plastic bag bans are not easy and there is always a lot of opposition, but the hard work pays off and the environment, along with the tax payers who foot the litter cleanup bill reap the benefits. People against the fee argue that disposable plastic bags are just a part of the litter problem and the fee only targets plastic bags; therefor, the fee is not completely addressing the problem and is not a constructive solution. Recent research has found that the number one form of litter picked up in Corpus Christi are cigarette butts, followed by Styrofoam, and plastic bags come in as the third most common type of litter. The criticism that the fee does not address the problem is not an accurate assessment. It is true plastic bags are not the sole type of litter and it turns out they are not even the most prevalent, but they are a significant portion of it. Reducing the amount of bags will directly impact the amount of litter, and completely banishing plastic bags will do even more to alleviate the litter debacle. Reducing the amount of litter may be the primary goal, but in order to get to that point the individual components of the problem have to be addressed. There is no reason why the city should not also look into reducing cigarette butts, Styrofoam and other types of litter after the campaign to reduce plastic bags has reached an acceptable conclusion. Anything worth doing is worth doing well and taking on a problem as big and complex as the litter mess facing Corpus Christi will need to be a multistage effort. Only when the plastic bag problem is under control should the city target another form of litter and so on and so forth. Luckily Corpus Christi is treating this first phase as an experiment. If a media campaign to encourage people to forgo disposable plastic bags for reusable bags and beefed up litter ordinances do not solve the trash problem the City is prepared to come back with a stronger stance, possibly in the form of a plastic bag fee. Hopefully the campaign works and Corpus Christi can bid their plastic bag litter problem a fond farewell. Realistically this is not very likely, so it is nice to see the City has a more serious and effective plan in the wings. Cliff Schlabach, the local Surfrider chapter chairman said, “You want to break people’s habits? Hit them in the pocketbook. If it’s not free, then people will pay more attention to what happens to them.” Mr. Schlabach certainly has a point and it is very likely that in about a year his words will become a reality. It is frustrating that the City will not address the flaws of their current plan and learn from the experiences of other cities which have successfully reduced the amount of plastic bag litter that plagues their streets. The silver lining in this entire situation is that Corpus Christi is in fact on track to take a stand and solve their plastic bag problem; they just may not see any major results until they opt to try alternate solutions. Read more about the City of Corpus Christi and their struggle with plastic bag litter at http://www.caller.com/news/2012/may/29/increased-enforcement-retailer-backed-outreach/. Go to http://www.kztv10.com/news/plastic-bag-fee-could-be-coming-to-corpus-christi/ and check out the videos to learn more.